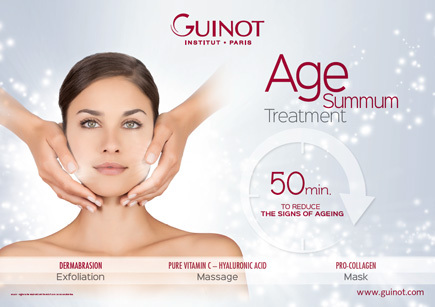 Age Summum is Guinot's brand new manual, hyaluronic acid anti-aging treatment developed for mature skin. The treatment rejuvenates your skin in 4 steps and it can reduce the depth of wrinkles by 49 degrees. With a dermabrasion peeling creme we massage your neck, face and decolletage to remove dead skin cells and help the skin absorb the anti-aging active agents completely. Phase 1: Cellular Life Complex with 56 active biological active agents, which are necessary to cell function, they stimulate cell regeneration and metabolism. Phase 2: Pure vitamin C - it stimulates collagen sythesis and its antioxidant effect makes your skin naturally glow. Hyaluronic acid facial massage creme and the 15 step manual massage technique activate the real skin rejuvenation for a tauter, smoother look. A fabric mask sodden with hyaluronic acid and vitamin C that completely fits your face. If you buy a course of 3, you get a Guinot muscle stimulation facial gymnastics for free at every turn.